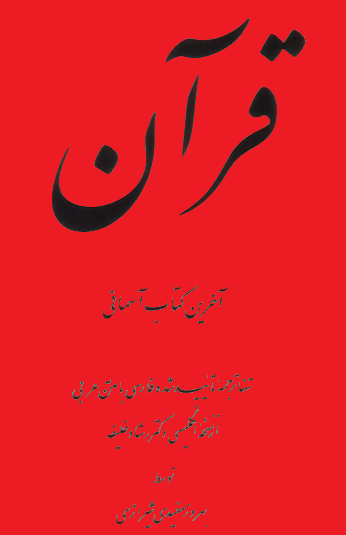 Dear Readers, I have translated Dr. Khalifa's English translation of the Ghor-on into a Farsi language by his authorization, and I have printed the Farsi Ghor-on in 1995 by the will of Allah, the Hakim. Then on May 19, 2006 I was guided by the Almighty Allah, that we should not translate the Arabic Ghor-on into other languages for other people. Because Allah sent the Ghor-on in an Arabic language in order for us to use our brains. That means, Allah wants us to translate the Arabic Ghor-on for our own, because Allah wants to teach us, and reveal to us His Arabic Ghor-on, instead of using translator's given knowledge. So, I have repented to Allah, and asked Him for His forgiveness. I am very sorry that I have been misleading so many E-rawnians, and caused them to fall in to the unforgivable sin, which is idol worship. Therefore, if one studies any translation of the Arabic Gho-on, that means, he or she is following from another Ghor-on, besides Allah's only Arabic Ghor-on. And that would be considered as a "Shirk" or idol worship. And that would be an unforgettable sin, as far as Allah's Arabic Ghor-on is concerned. I hope it is not too late for you to repent, and ask Allah for His forgiveness, so you could go back to Allah, the Hakim. By the will of the Almighty, Creator, The Hakim, I was supposed to translate the Ghor-on into the Farsi language as a test for all of us, because Allah wanted me to be the first one, who has repented to Allah for translating His Ghor-on. Thank Allah, The Hakim. With the will of Allah, The Almighty, on the 27th blessed night of blessed month of Ramadan of the year 13 B.H. (610 A.D.), Prophet Mohammad's soul was taken up by the Holy Spirit together with angles. He was taken from the Sacred Mosque in Mecca to the Farthest Mosque in the Highest Horizon as the stars were falling away. Allah came down as close to Mohammad as two bows length or closer, then Allah placed the blessed Arabic Ghor-on into Mohammad's heart as one revelation while he was looking at Allah. Later on, over a period of 23 years, with the will of Allah, The Almighty, the "Arabic Ghor-on" was being recited to him through angel Gabriel's mediation, according to the event of his time, and also he was giving special instructions as to which revelation goes where in the Arabic Ghor-on, after revelations completed. And Muhammad wrote down the Arabic Ghor-on in the order which he was receiving, with his own hand. After departure of Allah's final prophet, Muhammad, peace be upon him (27:59) the scribes who wanted to copy the Ghor-on and take it to different countries; they added 2 false ayats (verses) at the end of sura (chapter) 9, in order to idolize the prophet. This horrendous crime caused a 50-year war between idol worshippers and Submitters. Finally Umayyad rulers burned the original "Arabic Ghor-on", written by Muhammad's hand in order to avoid any future disputes. Ever since, the whole world was deprived from the original "Arabic Ghor-on". 1400 years later, the Almighty, Allah send His messenger of the covenant, Dr. Rashad Khalifa, with an awesome discovery of undeniable and irrefutable scientifically mathematical signs in the Arabic Ghor-on. In an era that mathematic is the mother of all sciences. Therefore, the awesome mathematical signs that you have been witnessing in this website purified the Arabic Ghor-on from any distortions, and proved that the Arabic Ghor-on is the only untouched message of Allah to humanity. 20- Surely, you are receiving the Ghor-on from the presence of the all Hakim and the all knowing (27:6). But, for those who read the translation of the Ghor-on, they only receive what was inspired by the translator. Please verify the Arabic ayat yourself. Fight your most ardent enemy (satan) in this life. 21- Do the people think that they will be left to say, we believe, without being put to the test (29:2)? Allah is giving us another respite after these past 21 years, and now it is our term that either we study the Arabic Ghor-on, or not. Brothers and sisters, you would not get any knowledge, Hikmah, from the Ghor-on, unless you study the Ghor-on in an Arabic language. Allah made the Ghor-on easy to understand, is there any one wish to learn (sura 54)? 22- My Lord, my people have deserted this Ghor-on (25:30). On the day of resurrection we are all going to be confronting Allah, the Almighty, and He would ask us, that I sent down to you 10 ayats in the Arabic Ghor-on, that My Ghor-on came with an Arabic language. And I send down this Arabic Ghor-on in the tongue of the prophet, whom I have chosen him from amongst the Omieen, that their language was an Arabic language as well. Then, why did you disbelieve on those 10 ayats, and went after Ghor-onic translations instead? Would you have any answer for Allah? That would be too late then! . . . . Fight your most ardent enemy in this life. 23- This is an awesome Hikmah from Allah The Almighty, Allah swears by the positions of the stars that His Ghor-on is an honorable Ghor-on, and He is telling us that there is a mother book, master file, master book, at Allah which is proptected (13:39). Then (43:1-4) says that Ghor-on is one of the chapters in that Master book, and the language of that Ghor-on is in Arabic Language (56:74-81) Allah be Glorified!. Allah erases whatever He wills, and He will estabishe, and at Him is the Master book (13:39). I swear by the positions of the stars. This is an oath, if you only knew, that is so great. This is an honorable Ghor-on. In a book that is protected. None can touch it (Hikmah) except the ones who purify and cleanse themselves (Mutahharoun). A revelation from the Lord of the universes (56:75-81). In (46:29-32) we read that Allah directed few jinns to Muhammad, the last Prophet of Allah, in order for them to listen to the Ghor-on. That means they were listening to the Arabic Ghor-on, becasue the Ghor-on was revealed to prophet Muhammad was revealed in an Arabic language! Allah be glorified! Pure, holy, sacred, immaculate. A person who is not : unclean, defiled, filthy, impure, polluted, untouchable. Who is without any: Sexual lost which is inappropriate, defect, fault, shortcoming, flaw, blemish, blot, damage, imperfection, impairment, vice, disgrace, dishonor. Who is: guiltless, sinless, free (from or of), blameless, innocent, clean, chaste. Who has: nobleness, superiority, preeminence, prestige, honesty, reputation, hono(u)r, dignity, moral distinction, perseverance, endurance, constancy, stability, firmness. But, no matter if you have born as an Arab, and live among the Arab people all your life, and no matter how many masters and PhDs you might have in Arabic Language, if you DO NOT have those Characteristics mentioned above "Tahara", you may never ever get any Hikmat from the Arabic Ghor-on. But, if you are not an Arabic speaking person, and have those Characteristics mentioned above and try to understand the Arabic Ghor-on through the dictionaries, just make sure that Allah will teach you the Arabic language, and will give you the Hikmah. This is the greatness of Allah's Arabic Ghor-on. Allah be glorified! 24- Becoming a judge takes years of study and hard work, in order to learn the laws and rules and regulations of the society, which he lives on, until he gets to the point that he is able to judge amongst the people. Then when I and you come up with some disputes, we would ask his help. And we thus have revealed laws in Arabic, and if you ever follow their wishes, after this knowledge has come to you, you will have neither ally nor a protector against Allah (13:37) Allah has sent us a great book named the Ghor-on, containing Arabic laws. In this book one would find all the rules and regulations that one must follow in submissive society, which Allah preferred for us. And Allah cited all kinds of examples in the Arabic Ghor-on for us. In sura 5 we read, …those who do not judge in accordance with Allah's revelations are the disbelievers (5:44). ...Those who do not judge in accordance with Allah's revelations are the unjust (5:45). ...Those who do not judge in accordance with Allah's revelations are the wicked (5:47). In these ayats Allah is informing us that we should study the Arabic Law, the Arabic Ghor-on, carefully, because with it we must judge amongst the people. And we thus sent it down as an Arabic law, and if you ever follow their wishes, after what has come to you from knowledge, you do not have Allah as an ally nor a protector (13:37). It is obvious, that if you do not know what is written in the Arabic Ghor-on, you would not be able to judge among people. In this important subject again one can recognize satan's tricks on believers. If you notice when ever we come up to pass a judgment, every one would say, Oh no, do not judge! It is not right to judge. Now this person may just came from super market and has chosen good and fresh vegetables or picked up some nice apples with his or her judgment. Or she might have been coming back from shopping and by using her judgment she finally chose some shirts from amongst 100s. Or, may be these guys are just coming back from a basketball game, and they are talking about players, that this guy was good, and the other one did not play a good game, as they were judging. Or may be he is just coming from the court of law, and the judge made him pay some money for his citation ticket! Only believers, just and righteous people judge with the Arabic law. Please verify the Arabic ayats yourself. 25- Those who are believers and do good deeds, and believe in what was sent down to Muhammad, which is the truth from their Lord, He will remits their sins, and improve their affairs (47:2). Do we believe in what was sent down to Muhammad? The Arabic Ghor-on was sent down to him. What would be your answer to Allah, the all Great, on the judgment day? Well, we heard of an Arabic Ghor-on, and we have seen it, and we were carrying it for years with the transaltions right beside it, but we did not study it, and instead we only have read Ghor-onic translations, and we just relied on translators, and we have been idolizing them!. . . Fight your most ardent enemy in this life. 26- In (3:48) the Almighty is referring to Jesus son of Mary, we read, angels say, He will teach him the Book and Hikmah and Torah and the Gospel. The meaning of the word "Book", "Al-Kitab" in some ayats have always been my question, and no one has had any convincing answer for this word, until Allah, The All Hakim guided me to its meaning. Assume that you want to learn chemistry, and you have a chemistry book in your hand. When you want to learn chemistry from this book, no one would tell you that, I would teach you the book and chemistry! Because, it is so clear that the knowledge inside of that book is chemistry. We know full well that the knowledge within the Ghor-on or any other scripture is called "Hikmah" so, we can not say, we teach you the scripture and Hikmah, because, Hikmah is within the Arabic Ghor-on. Therefore, the word "Book" in this ayat must have a different meaning, and that is "literacy", being able to read and write. That means, He will teach you litreracy and He will teach you Hikmah. In (62:2) we read, He is the One Who sent to the Omieen a messenger from amongst them, to recite to them His ayats, and to purify them, and teach them literacy and Hikmah. Before this, they were clearly straying as well as others from amongst them who have not yet joined them (like us). And He is the Almighty, Most Hakim. Please check these ayats as well (62:2; 4:113; 4:54). Fight your most ardent enemy (satan) in this world. You may check (5:110) as well. Now remember, at the time of Muhammad the Arabic script was only 100 years old. In the older times education was only for the wealthy people, and most of the people were illiterate. It is only within the past 100 years or so that we have been building schools and universities all over the world. Now we live in a society that education and acquiring knowledge is very important. It would be so shameful if we would go back to Allah in complete illiteracy, and have not study the Arabic Ghor-on. How are you going to respond to Allah? He would says, you have read and studied all kinds of books, and you have studied all kinds of sciences that I have send down to you, and for years you went to different schools, but why did you not study My Arabic Ghor-on? This ayat is telling us that Allah does not want us to be illiterate. Because, literacy in one of the main sources of communications in todays world. The first translation of the Ghor-on was done in 884 in Pakistan. In 1143 Ghor-on was translated to Latin languages, and In 1547 to Dutch and Italian languages. And in late 1800 translated to an English language. At the time of Muhammad no one translated the Ghor-on in to any language. Each word in Arabic language has a range of meanings, and for this reason no one can translate the Arabic Ghor-on for another person. This is the same wording Thomas Jefferson used. One year before writing the Constitution, Jefferson went to England and purchased 2 Ghor-on translations, because they wanted to get religious laws from scriptures in order to use them for writing the Constitution. And after he studied those 2 Ghor-onic translations, and compared them, then he realized that he should learn the Arabic language in order to understand the true meaning of Allah's word, so he did. Allah is the only Teacher of the Arabic Ghor-on, and He will Teach each and every one of us as to what meaning should be use for the words of the Arabic Ghor-on. 27- In (2:79) we read: Then, woe to to those who write the book with their own hands, then say this is from Allah, in order to sell it for a cheap price. Then, woe to them for what their hands have written, and woe to them for what they have earned. 28- There are some ayats referring to Muhammad that he fabricated the Arabic Ghor-on. In (11:13) we read, Or they say, "He has fabricated it". Say, then bring 10 suras like it fabricated, and call upon whomever you can besides Allah if you are truthful. 29- Here is another awesome revelation from Allah, The Almighty. We read in (17:46) And we placed coverings in their hearts, lest they understand it, and in their ears, deafness. And when you mention your Lord in the Ghor-on Alone, they turn their backs in aversion. Allah is telling us that Allah Alone, and Ghor-on Alone, and His Ghor-on Alone came down in an Arabic language. Allah repeated for us in the Arabic Ghor-on 10 times… so Ghor-on Alone is in an Arabic language, please check section (23) above. If you check on internet you would find so many Ghor-ons, Pickthall's Ghor-on, Shakir's Ghor-on, Yusuf Ali's Ghor-on, Sher Ali's Ghor-on, Rashad Khalifa's Ghor-on, and Dr. Fazely's Ghor-on. . . . Dr. Khalifa had 3 Ghor-on. But, Allah says that He has Ghor-on Alone! May Allah forgive me for misleading so many people by my Farsi translation. Allah willing they would find this web site and recognize these ayats from the Arabic Ghor-on, and stop reading the translations and start studying Ghor-on Alone. Brothers and sisters please do not fabricate another Ghor-on besides Ghor-on Alone. People please do not turn your backs to Allah Alone and Ghor-on Alone, and those 10 ayats, please do not betray Allah's Arabic Ghor-on. This is an extremely important ayat. Did you forget about this ayat? Fight your most ardent enemy (satan) in this world. Now, they go back to Allah on the Day of Judgment. Do you think Allah is going to judge them according to Pickthall's Ghor-on, or Shakir's Ghor-on, or Yusuf Ali's Ghor-on, or Sher Ali's Ghor-on, or Rashad Khalifa's Ghor-on? NO, Allah is going to judge them according to His Arabic Ghor-on Alone in that master file, or mother book at His disposal, which is proptected (13:39; 43:1-4; 56:74-81). Allah be Glorified! Any submitter would fall prostrate to this awesome Hikmah. Allah knows already that we are going to come up with excuses, that is why He already closed all the doors for those who would come up with these kinds of excuses. Allah is Great! So, stop misleading yourselves and stop misleading other people, and start reading the Arabic Ghor-on. When do you want to submit to Allah Alone and His Ghor-on Alone? 30- Allah is informing us in the Arabic Ghor-on that no one should explain the Ghor-on to us, only Allah dose that. No one should fabricate any saying and attribute it to Allah. No one should teach us the Arabic Ghor-on except Allah the Most Gracious. (75:16-19) Do not move your tongue to hasten it. Indeed it is up to Us to put it together and to recite it. Therefore when We have recited it, follow its recitation. Then, it is for Us to explain it. No one should explain the Ghor-on to us, only Allah dose that. When one translates the Arabic Ghor-on to another language, it is as if that person is explaining the Ghor-on to others. (69:38-48) Allah says, I swear by what you see, and what you do not see. This the utterance of an honorable messenger. Not the utterance of a poet; rarely do you believe. Nor the utterance of a clargyman; rarely do you take heed. A revelation from the Lord of universes. And if he had fabricated against Us some of the sayings, We would have certainly seized him by the right hand, and then certainly We would have cut off his Aorta. Then none of you could have shielded him from us. This is a reminder for the righteous. No one should fabricate any saying and attribute it to Allah. When one translates the Arabic Ghor-on, it is as if that person is fabricating some of what Allah is saying in the Arabic Ghor-on. What we have done with our own hands all these years is that we have deprived ourselves from the Arabic Ghor-on, and have sealed, and veiled our own eyes by reading the translations, therefore we can not see the Arabic Ghor-on any more. It is just like you paint the wall or a wooden desk, therefore you are not able to see the actual wall or the wood any more, becasue you have got used to see the colors only! When you translate the Arabic Ghor-on to any language, then people are not able to study the actual Arabic Ghor-on. This is the consequence of translating the Arabic Ghor-on, and rejecting those 10 ayats. As Allah says in (7:40) surely, those who reject our ayats and are too arrogant to uphold them, the gates of the sky do not open for them, nor will they enter Paradise until the camel passes through the needle's eye. We thus punish the transgressors. Please people do not reject Allah's revelations. (55:1-2) The all Gracious, teacher of the Arabic Ghor-on. No one should teach us the Arabic Ghor-on except Allah, the Gracious. When one translates the Arbic Ghor-on, it is as if that person is teaching the Ghor-on to the others. How much evidence do we need from Allah's Arabic Ghor-on? Please check these ayats yourself. There is an amazing fact that parrots or chimpanzees and dogs, dolphins, and sea lions have already learned different languages of humans all around the world, but only human being Does Not want to learn the language of Allah's book, meaning the Arabic Ghor-on!?. . . That is why animals are "Submitters" to Allah, and most of us are not. 31- Now that we learned that "No one should explain the Ghor-on to us, only Allah dose that. No one should fabricate any saying and attribute it to Allah, and no one should teach us the Arabic Ghor-on except Allah the Gracious. Then, this awesome inforamtion from Allah, The Almighty leads us to our Khutbas. The word "Khatib" means the one who is giving the speech, and "Khutbah" means the subject of the speech. In the present century for the first time Khutbahs were distorted just like other duties of "Submission" and people all around the world are performing the Khutbahs in their native language, because not every one would understand Arabic language. Yet, Khutbah was always performed in an Arabic language. Just like Contact Prayers "Salat". And when you are observing your "Salat" prayer you are reciting from the Arabic Ghor-on, sura "Al Fatihah". For this reason the Khutbah sermon must be delivered in an Arabic Language. If you read the ayat about Friday Prayer in (62:9) Allah says, O you who believe, when it is called out for contact prayer on Friday, you shall rush to remembrance of Allah, and leave off business. This is better for you, if you only knew. This Ayat says, when there is a call for Friday prayer, rush for the "Dhikr of ALLAH." This word "Dhikr" means reciting the name of Allah. In this ayat Allah dose not say, "Tadhkir" meaning "giving advice" to educate or to admonish, it only says, to remember Allah, and nothing ells. As Allah informed us in section (30) above, that No one should explain the Ghor-on to us. No one should fabricate any saying and attribute it to Allah. No one should teach us the Arabic Ghor-on except Allah, the Gracious. Yet, we came up with a "khutbah sermon." People get together on Fridays, as Allah prerscribed for us in the Arabic Ghor-on, and then they all sit down, facing toward Qiblah, and a man stands up facing people instead of facing Qiblah, and he would give them two parts speeches, which could be about findings in the Ghor-on, or politics, or social matters, or educating, or admonishing. Then they repent in between the two khutbahs!?. . And then when the two speeches finished, then they standup and start to commemorate Allah, meaning reciting Al-Fatehah. . Wow! But, Allah said, meaning, "Standup for Contact prayer." not sitting down! And Allah said, When you standup for contact prayer, you should all face Qiblah, where ever you may be. Now if you remeber when Allah talked to Moses for the first time, He told him "observe the "Salat" Prayer in order to remember Me", " Dhikri" (20:14). We have been told that we should be quiet at Khutbah sermon. In (46:29) When Arabic Ghor-on was reciting, Jinns said, "be quiet and listen". Again Allah says in the Arabic Ghor-on that "when Arabic Ghor-on is reciting, you should be quiet and listen that you may attain mercy" (7:204). We have mathematical confirmations from Allah about the "Rakats" in Friday prayer, which proves that the "Salat" prayer should be 2 "Rakats" on Friday prayer, instead of 4 "Rakats" as we perform in other days of the week. Khutbah sermon replaces for other 2 "Rakats". Yet we came up with 2 Khubahs sermon!... and then in between the 2 we repent...! But, Khutbah is only one part speech and then "Salat" prayer right after it. Do you talk when you are reciting Al-Fatihah? Do you repent between the 2 Al-Fatihahs? Now here is an awesome gift from Allah regarding "Khutbah". As you read in ayat (62:9) above, Allah says, "When it is called out for contact prayer on Friday." As you notice Allah dose not say observe "Khutbah on Friday, yet He says, observe "Contact Prayer on Friday". Allah be Glorified. . .
For more mathematical confirmations regarding Contact Prayers and Friday Prayer please go Here. Therefore, here is another manmade "Hadith" ritual that we came up, with the help of satan, instead of just performing "Contact Prayer on Fridays".! . . .
32- In (17:73) we read, And they almost caused you sedition on what we have been revealing to you, in order for you to fabricate other than this. And then they would have taken you as a friend. They wanted Muhammad to turn the language of the Arabic Ghor-on to Meccaian language, so they can be friend with him! But, he did not, that is one of the reasons that for 10 years of his life he was fighting with them. This is exactly what we have done. Do you think if Dr. Khalifa would have said, that go ahead and study the Arabic Ghor-on, people would have followed him? NO they would have left him right then. But, since he turned the Arabic Ghor-on in to another language and fabricated the Arabic Ghor-on to an English Ghor-on, by the will of Allah as a test for us, then every one started praising him and idolizing him and they took him as their friend. Same thing happened to me when I traslated the Farsi Ghor-on, lots of people started praising me. But, now when I say people please read the Arabic Ghor-on that Allah, The Almighty created for us, and do not mislead your selves by reading the translations, then every one becomes my enemies, and they call me names! Ghor-on be Glorified. I just wanted to advocate righteousness, and forbid evil. When Allah blesses some one, no one can curse him! In (17:88) Allah says, Say, if all the jinns and humans get together in order to bring a Ghor-on like this, they Could never been able to bring one like it. Even if they help each other. But, human beings think that they are much smarter than a l l the jinns and a l l the humans a l l together. . . I can bring a Ghor-on. . .O' yes I can. . . Here it is!. . . Please verify these ayats yourselves. Please do not waist your time on what Allah DID NOT ask you to DO, because you would not get any rewards for it, and study the Arabic Ghor-on Alone, that may Allah showers you with His blessings. May Allah guide us so we do not go back to Him blind. (47:7) O you who believe, If you help Allah, Allah would help you. 33- There were a group of people whom for 21 years have been put to a test. And they were all participated in a big laboratory. They were all have been given Ghor-onic translations, in order to find out, that after few times reading, would they be able to get more information than what they already got through few times reading? Then as they were all witnessed after 21 years, none of them could get anymore information. What they did was that they kept the original Arabic Ghor-on, which Allah created for them in a freezer, and they were all totally depended only on translations. Only those who were studying the original Ghor-on, meaning the Arabic Ghor-on, could found out more information, but the rest were frozen in time. Every community must go through a test, because human beings are forgetful, weak, and always in a hurry. Do the people think that they will be left to say, we believe, without being put to the test (29:2)? Allah is giving us another respite after these past 21 years, and now it is our term. Our test is to see if we study the Arabic Ghor-on, or not. For 21 years you have been studying the Ghor-onic translations, or Ghor-onic fabrications, only 600 pages or so. Remember these translations are just like any other books. The words in these translations Do Not have a range of meanings like the Arabic Ghor-on has. It is just like that you have been kept reading the same book over and over. These translations are not the Ghor-on, and They Are Not from Allah either. Only the Arabic Ghor-on created by Allah. Stop idolizing translations. Ghor-onic translations are just inspirations and conjectures of some people. Therefore, by reading it few times you should have been learned it all, and you would have been memorized it all. Let me ask you this question, "do you read for example "Hammlet" or "Gone with the wind" or "One flwe over the cuckoo's nest" for 21 years everyday of your life"? You see how rediculously we acted? You DO NOT get any new information if you just read a certain book over and over. The same rule applies to Ghor-onic translations. That is why no one has any questions after reading the Ghor-onic translation few times, because you have learned it all. It is just like you have been going to school for 21 years, and every year you have been taking the same course of (Eng-1) over and over!. . . If you get to the point that you do not have any more questions, just be sure that you are in a wrong "Nest" and you must fly away!. . . Becasue, you are not learning anything ells anymore. Yet, the Arabic Ghor-on is full of Hikmat, and never ends. Fot the past 21 years you have been pleasing yourselves and others. Isn't it time now to please Allah Isn't it the reason that we are hear, just to please Allah, and no one ells? Then, study Allah's Arabic Ghor-on. We read in (2:207). And among the people there is he who sells his soul to seek Allah's pleasure, and Allah is most kind to His servants. Remember all the honors and respects belong to Allah. You do not want anybody's respect and honor in this word, and we are all here to please Allah and to be honored and respected only by Allah. When you read the Arabic Ghor-on your questions never ever end. This is the different between the Arabic Ghor-on, and Ghor-on translations. Please do not waist your time and start pleasing Allah, and submit to Allah, Who created for us the Arabic Ghor-on. satan Dose Not want you to see those 10 ayats, and he is trying his best to make you forget, and ignore them. Fight your most ardent enemy. If this was not our test after all these years, then tell me what was our test? 34 - Satan has gotten permission from Allah, that he would misled humans. That means anything that Allah advised us to do in the scriptures, meaning the religious duties, he would come up with something completely opposite of that, in order to mislead those who want to follow Allah's only religion "Submission". satan will come from the right side and the left side and from our back and from in front of us any way possible, in order to distort Allah's religion. So far almost all the duties of Allah's only religion, "Submission", has been distorted, except "Recitation of the Arabic Ghor-on by men." If you search the internet you would not find a single web site with "Ghor-on recitation" in different language rather than Arabic, and surprisingly still men are the reciters! This is awesome news, thank Allah. The Recitation of the Arabic Ghor-on by men is the only thing in "Submission" that the most ardent enemy of ours, satan, has not touched yet. Actually he does not know what to do with this one yet! The reason is that he knows that we just listen to recitation of the Arabic Ghor-on, and it is not something we have to perform daily. But, he goes and distorts religious duties which we must perfom daily. One of those is to read the Arabic Ghor-on. But, the most important lesson Allah is teaching us here is, that we must know the Aarabic language in order to understand what the reciter is reciting from the Arabic Ghor-on! . . . Please think about it. How many signs do we need from The Almighty Allah in order to believe that Ghor-on is in Arabic language? First of all, satan came up with so many different religious names beside the only religion of Allah "Submission". Any religious name you hear rather than "Submission" it is only a man made religion that he whispered to us, but Allah calls them Parties (30:32). As we are all witnessing satan's distortion of our daily Contact Prayers, our Zakut Charity, Fasting in the month of Ramadan, Hajj pilgrimage, and Studying the Scriptures. Our Contact Prayers should have been the same Prayers as Ebrahim, Moosaw, E-saw son of Maryam, and Muhammad were performing. But, most people have been forgotten the Prayers, and now each party (Jews, Christians, and Muslims 30:32) are happy with what they do as their Prayers. And Friday Prayer was distorted to Friday Prayer Sermon, in order to give advice, or to educate or to admonish instead of just remembering Allah. Obligatory Charity and Fasting has been distorted as well. All those different parties used to go to the city of "Canaan" for Hajj Pilgrimage, then some times in history the name "Cannan" changed to "Mecca", and then people have forgotten the Hajj ritual through the years. Yet, all these parties were supposed to follow only one nation, and that is "The Nation of Ebrahim." satan whispered to people in order to distort the scriptures. So he came up with translations, and he made us to translate the Torah (4:46) in order to mislead us, and you may have heard about the recent discovery of "The dead sea scrolls." As you know the Enjeal has been translated and distorted as well. That is why there are few different Enjeals in the market. satan could only add those 2 false ayats at the end of sura 9 in the Arabic Ghor-on, and misspelled some words and changed the name of few suras, then he came up with translations of the Arabic Ghor-on, in oder to mislead us, because he knows the greatness of the Arabic Ghor-on, and he knows in other dimension, that no one is capable to translate the Arabic Ghor-on, unless fabricating something out of our personal conjectures and understandings. And by following them we can easily be misled. That is why when you search for the Ghor-on on the web, you would find so many different versions of Ghor-onic translations in so many different languages. And satan knows that Allah is the only One Who is able to teach us the Arabic Ghor-on. Yet, he made some of us to read fabricated translations in order to mislead us. But, Allah's truth will be prevailed, and satan's falsehood will be demolished. Allah, The Almighty gave us the whole life long to learn the Arabic Ghor-on, supported by 10 firm ayats (Muhkamat) in the Ghor-on, and He made the Ghor-on easy to learn. Does any of you wish to learn? May Allah help us all to cleanup this mess! Do not idolize Ghor-onic translations, they are not from Allah. Allah's message is in the Arabic Ghor-on. Remember no matter if you have born as an Arab, and live among the Arab people all your life, and no matter how many masters and PhDs you might have in Arabic Language, if you DO NOT have those Characteristics mentioned in section (23) above "Tahara", you may never ever get any Hikmah from the Arabic Ghor-on. But, if you are not even an Arabic speaking person, and have those Characteristics mentioned above, and try to study the Arabic Ghor-on through the dictionaries, just make sure that Allah will teach you the Arabic language, and will give you the "Hikmah" from the Arabic Ghor-on. There are no Hikmahs in English or Farsi Ghor-on. 35- Did you know that all the Submitters in the world know at least one Arabic sura from the Ghor-on and they can read it and understand it as well? And they are repeating it at least 17 times a day? Yes, and that is sura Al-Fatehah!. . . Now how long did it take you to learn it? Couple of hours, or may be couple of days? Was it too painful to learn? Was it too difficult to learn? Did you go through hardship? You have been practcing it every day 17 times a day for so many years . . .Don't you think that all these years you could have learned the rest of the Arabic Ghor-on in the same way? Now, why did you learn the Al-Fatehah in the first place? Because, at the beginning you have been told, that you must perform the Contact Prayer in an Arabic language. You asked, why? You were told, because, Al-Fatehah is a sura from the Ghor-on, and Ghor-on came down in an Arabic language, therefore we must recite the Al-Fatehah in an Arabic language. Allah be Glorified! Years ago most of the peole in the whole world were reading the Ghor-on in Arabic language. Only within the past 100 years or so people started to read more translations of the Ghor-on. The reason seems like it to be just being prejudiced. We just Do Not like to learn the Arabic Language. Some countries, or representatives of some countries want you to speak their own native language, when they are being interviewed, rather than talking to you with your native language. This is a sign of being Proud and being Prejudiced. Allah Does Not like His people to be Proud, Arrongant, and Prejudiced. Yet Allah likes His people to be Humble and Submitter and learn His Creation, the Arabic Ghor-on, in order to take them out of darkness in to the light. Allah says, "Why do they not ponder on the Ghor-on? And If it had been from anyone other than Allah, indeed they would have found in it numerous contradictions (4:82). I do not know how many more signs from Allah you need in order to believe in Allah's ayats in the Arabic Ghor-on? Allah is saying in S o o o. many different ways that His Ghor-on came down in an Arabic language, and the Ghor-on translations are not coming from Allah. . . . That is why the ayats in translations contradict each other. Please people submit to Allah's revelations in the Arabic Ghor-on. Please verify this ayat yourselves. Allah knows that our religion would be distorted, and we would be adding lots of traditions and cutoms to our religion, that is why at this time He sent down His Arabic Ghor-on supported by awesome mathematical signs, in order to take out all of those distortions. 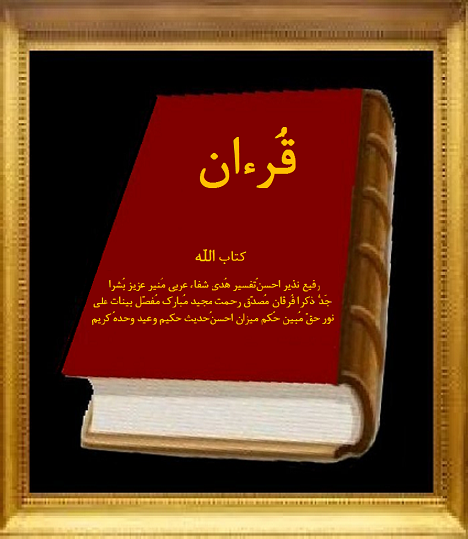 Arabic Ghor-on contains the absolute truth and perfect history from The Almighty Allah. Now that Allah purified the Arabic Ghor-on for us, then that would be our responsibility by following Allah's commands in the Ghor-on, and purify the religion for Allah. These ayats are saying that distorted religion Does Not belong to Allah. As long as we are worshipping the traditions and man made religion, we are all in a wrong track, another words we are not on the straight path, until we purify the religion and follow it. That is why we keep repeating, "Guide us in the right path" 17 times a day, and still we are not in the right path. Allah knows that we mess up His religion. What is the use of repeating that phrase 17 times a day, while we do not do anything about it? Allah gave us hands and feet and hearing an eyesight and brain in order to use them, and move ahead. You can not sit at home and praise your boss, and expect any salary at the end of the day! We are suppose to strive in the cause of Allah, not being relaxed in the cause of Allah. At the time of prophet Muhammad his people were going to war in order to kill, or to be killed. Then here we are sitting back, and we do not even want to study Allah's Arabic Ghor-on, because we just do not like Arabic language. . . Shame on us! . . May Allah fogive us! So according to the Arabic Ghor-on, the best Hadith, we should purify our relogion. We know about those 10 ayats that says, Ghor-on came down in an Arabic language, in order to use your intellect. As a believer our job is to put aside the Ghor-onic translations, which they are not coming from Allah, and they are here only to mislead us by translators conjectures, and start studying the Arabic Ghor-on, which Allah sent us through His Holly Spirit. May Allah fogive me for translating the Ghor-on in to Farsi language. That is why Allah will test the believers and He just does not leave them alone. Once a person asked, that why Allah Dose Not leave the believers alone? Allah guided us, and we became believers, and we are observing our Contact Prayers, and paying our Charities, and Fasting and so on. . . Why does He have to test us? Actually that was a very good question. Only with questions Allah will guide us to the Hikmah from the Arabic Ghor-on. So why does Allah test the believers? Allah is The Almighty, and He is the Gracious, and the Merciful, that is why He chooses the believers from among the pure and impur in order for us to have a fair test 3:179. This is awesome, this is the Greatness of Allah, and being Compassionate Allah. Allah be Glorified. Allah is simply saying that among the believers there are some, who are plluted, and impure, and evil, and also there are some who are pure, clean, and innocent. Through the years these people are going to be exposed to Allah, and to themselves, and to others, so they would become witnesses to their own actions. Allah knows those two groups already, because He was The One Who Chose our souls for our bodies, that is how we have that stamp on our forehead that says, "Hell" or "Heaven". But, because He is the All Gracious and the All Mecrciful, He gives us the whole life time span. That is why only few people are going to make it at the end of the day. Therefore, beause you are a believer now, that does not mean that you can be dancing in the rain, and you are going to make it at the end. That is why this is not an easy task. We have to be constantly alert, and watchful of our acts, and try to purify and refine ourselves, and our religion of "Submission". Therefore, Just by saying "Guide us to the straight path" it is not going to help you, if you are just sitting down, and relaxing yourselves. We must constantly strive in the cause of Allah and move forward. Obviously there are some who are going to be losers and some are going to gain, but Allah is in charge. He Who Created all, therefore He Rules all. We should not fear any one, but Allah. Again Allah is saying that His servants who inherited the scripture are in three different groups. Some are transgressors, some are in between and relaxed, and some with the permission from Allah are racing to do good things.This last group acquires the greates bounty by the will of Allah. So do not be relaxed, and strive in the cause of Allah. Striving in the cause of Allah can be, that if you may want to observe more prayers every day, or spending few hours a day to study the Arabic Ghor-on instead of watching TV or . . . I am sure you have seen some pure, and innocent people among your family or your friends or at work, that you have been wondering that these people are so nice, how come they are not among the believers!?. . . Those are the unhappy pure ones among the impure, and evil disbelievers! This means by being pure is not going to help you. You want to be a believer who is pure. We should ask Allah to purify our souls. Allah is the One Who guides whom ever He wills to the right path. The One Who Creates is The One Who Guides. Impure "Al-khabeetha": Corrupted, Vicious, Rotten, Contaminated, Polluted, Cancer, Abominable, Hated, Degenerated, Wicked, Naughty, with Polluted intentions, Unclean, Filty, Impure, Ugly, Flatterer, Mean, Rascal, Evil inside and truthful outside! What GOD has prohibited, Bad mouth, schemer, Unpleasant. Pure "Al-Ttayyibi" : Good behaviour, Good Moral, Moral character, innocent, Pious, Pure, Genrous, with Clean intentions, Benevolence, Nobility, Virtue, Excellence, Pure in soul, Fawner, Clean inside, Easy to deal with, Not Mean and Wicked. Thank Allah some people believed in those 10 revelations from Allah the Almighty, and started to use their intellect in order to learn the Arabic Ghor-on created by Allah, as Allah prescribed for us in the Ghor-on. May Allah bless you, and more power to you. And I just wanted to thank them for their positive responds. Although, others called them "Stray" or they said, "these people are lost their souls." Just because they are reading the Ghor-on in an Arabic language, which was the original language of the Ghor-on revealed to prophet Muhammad by Holy Spirit. For the past 3 months if you would have learned only One Arabic word per day, you would have known 90 Arabic words by now, instead of rejecting Allah's revelations. It is that simple. 37- Allah said in 10 ayats that the language of the Ghor-on is in Arabic language, do not translate my creation! You said, Allah you must be mocking us? Allah said, I am Allah, why should I mock you? You said, what translation are you talking about? We have an English Ghor-on, Farsi Ghor-on, French Ghor-on, and German Ghor-on or . . . tell us which ones? Allah said, I am talking about the Ghor-on that I have sent it down through my Holy Spirit. Translations are not from Me. DO NOT waist your time on them. You said, are you talking about the hard cover one, or the green one, or the dark blue one, or the one with the red cover? Because, there are so many of them, tell us what color? Allah said, translations came out of translator's head, and because they fear people more than they fear Me, so they changed My revelations for the benefit of their families and friends and societies in which they are living in. But, I do not fear anybody, My Ghor-on came down with an Arabic language, and I created it with My own knowledge, the one I placed into Muhammad's heart on the blessed night of Ramadan, and angels were witnessed too. And I put the mathematical code in it, so no one can change it. But, although they saw the secret code, and verified it, yet they did change it by translating the Arabic Ghor-on in to different languages, and then they put My Arabic Ghor-on aside. You said, Allah there are so many people who have translated the Ghor-on, are you talking about Muhammad Picktall's Ghor-on, or Yousef Ali's Ghor-on, or Dr. Khalifa's Ghor-on, or . . . ? Allah said, none of those translations are considered being the Ghor-on. I have sent in down to you in an Arabic language, I repeated 10 times in the Ghor-on. Then, finally some of the children of Israel accepted the truth from the Ghor-on, and strove in the cause of Allah, and started to study the Arabic Ghor-on, although they almost failed to do so. History is repeating itself. You children of Israel are asking the same questions again! . . .
You have been reading the translations over and over, then after 21 years you have found out that all these years you have not aquired any information from the translations more than what you already new 21 years ago. You may go to Masjid Tucson web site, and read their news letters. They are all repeating the same thing over and over and over . . . there are nothing new in them. Why? The reason is that 21 years ago they put Allah's creation, the Arabic Ghor-on in a safe box some where, and they were reading just an English book, so they were frozen in time. Then all of us completely turned our backs to the Arabic Ghor-o, and avoid this awesome scripture. If we do not stop that, we would go through aimless life, for another 19 years. The Arabic Ghor-on contains Healing, and Blessing (17:82), there is Guidance in the Arabic Ghor-on (2:185 and 17:9). The Arabic Ghor-on is Great (15:87). The Arabic Ghor-on is Honorable (56:77). The Arabic Ghor-on is Glorious (50:1). The Arabic Ghor-on is full of Hikmah (36:2). The Arabic Ghor-on is Mighty (41:41). The Arabic Ghor-on has Allah's light in it (5:15). Just remember Allah is watching us, angeles are watching us, and people are watching us, the animals are watching us, your eyes and ears and your lips are witnessing. Therefore, we have all these witnesses against ourselves on the Day of Judgment. The- Arabic- words -have- a- range- of- meanings.- When -one -translates- the- Arabic- Ghor-on -to- any- other - language,- he -chooses -one -of- those- meanings- from- that -range -of- meanings... Therefore,- he- would- Block- other- people - to- see- those- other- meanings ,-which- Allah- created- them- in -the- Arabic- language- for- us . -As -if -to- say, "you- Do- Not -see, -unless what- I -see ". This is the same phrase Pharaoh used (40:29). (Believing man is saying) O my people, today, you obviously have the kingship, and the upperhand on the land, then who is going to help us from Allah's Might if it comes our way? Pharaoh said, "you do not see, unless what I see. I only guide you in the right path" (40:29). Now when you follow that translation, that means you are following a book besides the book of Allah, which is totally man made, and you are following someone's words besides the words of Allah. Doesn't this consider an "Idol Worship" and "Shirk"? This was the most logic way to put it, thank Allah for showering His gifts to us. Does this make sense to you? Now, would you choose Allah as the only source of guidance, or you would choose Pharaoh to guide you to the right path? Remember, that was the reason we all left those Synagogues, and Churches, and Mousques, because we did not want to know what preachers are thinking, we just want to know, what Allah is talking about, and we want to get the first hand knowledge from Allah Himself. Translators Do Not let us see the true words of Allah in the scriptures. Translators take away your freedom of choice, as far as choosing the true meanings of the words in the scriptures. This is how they distort the message of Allah. May Allah forgives me for translating the Ghor-on into Farsi lanuage. I was informed to write; there is a difference between translating the Ghor-on and translating the understanding of the Ghor-on. The first one is to avoid and the second one is to encourage to broaden the audience and convey the message. Amazingly the words in Hebrew language are just like the words in the Arabic language, they have a range of meanings as well. That is why in so called Judaism's high schools, they ask each student's interpretation of an ayat from the Torah. They encourage them to read the Torah in Hebrew language, so each one of them would be able to translate it by themselves. They know that Allah reveals to each one of us any of those meanings that He wills. This means Allah is the teacher of the Ghor-on, and not them. But, sadly, when these students grow up, and become a religious leader, they completely forget about democracy, and freedom of choice, and they force their own interpretation of their religion to us. They say, you should follow what ever we tell you. It is noteworthy that the words (Arabic) "Arbi" and (Hebrew) "Abri" both are made of 4 letters, and both are made of the same alphabets. Now for example about those words Impure "Al-khabeetha" and Pure "Al-Ttayyibi" in section (36). If you choose only one of the meaning from the range of those meanings in your translation, then the whole ayat would mean one way, and when you choose the second meaning, then you would have a completely different ayat. This is amazing, that is why the Ghor-on must be in an Arabic language, and we must learn those meanings. Allah knows already that children of Israel would turn the scriptures into different languages, and they would change and replace the words from their actual places. You may also look at (4:46, 5:41). Let us all purify the religion of "Submission" for Allah The Almighty. Brothers and sister, especially the old-timers among us, please submit to Allah Alone, Who Created the Arabic Ghor-on for us. Please believe in those 10 ayats, they are from Allah. Please do not ignore Allah's revelations. Kill that ego, do not fight with Allah's revelations. Believe me it is only going to get harder and harder on you. Allah would not leave the believers alone, so please submit to Allah Alone, and study the Arabic Ghor-on Alone, and do not tamper with Ghor-on's D.N.A., and let us all purify the religion of "Submission" for Allah. It is ok to make mistakes, we are here to make mistakes, all the prophets and messengers made so many mistakes along the way. Ibrahim the founder of "The Nation of Ebrahim", "Bani Esra Eil" which was translated by mistake as "Children of Israel", yet it means "The sons will be transported by Allah" and the religion of "Submission", made some mistakes. Moosaws brother Haroon, he watched his people idolize a calf, fearing that they might be dispersed. Dawood, Soleymon, Ay-youb, Youness, Zakarieya, Muhammad, and Rashad, they all made mistakes. Allah knows we make mistakes, and He is the Most Forgiver. But, some people would like me to say : Oh my Allah, oh please disregard what I was talking about. I made a mistake. Just ignore those 10 ayats, they are not in the Ghor-on, satan duped me, and I just made them up, do not fear Allah, and just read the translations, they are from Allah, and they contain absolute truth, and they are good for you, and all this time I was only kidding you! Please forgive me! Does this make you happy? Then, go for it! 38- When satan disobeyed Allah, and became an arrogant, Allah kicked him out of the heaven, and he was cursed, and banished, and rejected. He said, therefore, you must go down, for you are not to be arrogant here. Then, get out; you are indeed humiliated (7:13). That made him extremely unhappy, so he promised that he would take us away from Allah's straight path (7:16). He said, "Since You have enticed me, i will sit and wait for them on Your straight path." He is really mad and angry, and he is constantly lurking to ambush us. First of all, he does not like human because, we were created from mud and he was created from fire. Second of all, he sees us as the main reason that he failed his test. Therefore, through all his life, he would try his best to get revenge from us. That is why he would come from before us, from behind us, from our right side and from our left, in order to mislead us. he is the most ardent enmy of ours. As we are witnessing, he has done a good job so far. Then, I will come to them from before them, and from behind them, and from their right, and from their left, and You will find that most of them are unappreciative (7:17). Some time in history from the time of Muhammad up to now, we came up with stoning the devil in Mecca. People get few pebbles and throw them at three walls, called (Jamarat) as a ritual performed in the Hajj, but now they have been replaced by three towers. And every year so many people get killed and get injured, because of getting hit by stones. The reason we came up with this ritual is because Allah says, "shaytan rajim", "rejects shaytan", "stoned shaytan" or "shaytan worthy to be stoned". Therefore, we made those towers as the station of satan, and we throw stones at them, thinking we are following the Ghor-on, and we are rejecting and condemning satan. Now this made up ritual, again enraged satan to the extreme. Let us talk about the awesomeness of the Arabic language. The word "Rajama", means "To stone, Stoning, Surmise, talking through guess work, to throw, to curse." We read in (36:18), They said, "We consider you bad omens. Unless you refrain, we will surely stone you, or afflict you with painful retrebution." You may also read (11:91; 19:46; 44:20; 18:20,22; 3:36; 15:17,34; 38:77; 81:25; 26:116). In ayat (18:22) we read (Rajman Bialghaybi) meaning "Guessing at something of which they can have no knowledge", "Guessing at random", "Guessing at the Unseen", "Threwing stone in dark". "I seek refuge in Allah from rejected devil, stoned devil". Remember this is the same root word, when so called Muslims stone adulteress to death. Now here is an awesome gift from Allah The Almighty. Remember satan is our outmost enemy in this world. This is how shaytan duped us in order to come up with his outmost crime against Allah's system, and at the same time to get revenge from us. He said, are you stoning me? I will show you what stoning means. Then he came up with translation of the Arabic Ghor-on, or basically translation of any scripture. The word "Translate" and "Translation" in Arabic language is "Al-Tarjumah" or "Tarjomah" meaning "Stoning, Cursing, Condemning, Rejecting." In Ayat (44:20) we read, "And I (Moosaw) have taken refuge in my Lord, and your Lord, lest you should stone me." The word for "Translator" in Arabic language is "Al-Motarjim" or "Al-Tarjuman" meaning "The one who stones, Condemns, Rejects, and Curses." So when we say, "Rashad translates the Ghor-on", " (Rashad tarjomata Al-Ghor-on), we are actually saying, "Rashad stones the Ghor-on." Or, when you say "Translator, translates the Ghor-on", " " (Motarjim betarjomah Al-Ghor-on), you are actually saying, "The one who stones, stones the Ghor-on!" or "The one who curses, condemns the Ghor-on". . . This is how satan revenges! . . .
Ayat (9:9) says, They sold Allah's revelations for a cheap price. And they repelled from His path. Miserable indeed is what they did. satan made people to translate Allah's revelations, the Arabic Ghor-on, in order to sell it for a cheap price, and this is how he repelled them from the path of Allah. And in ayat (27:24) we read, (Hoopoe said,) I found her (Saba) and her people prostrating before the sun, instead of Allah. And satan has adorned their works in their eyes, and has repelled them from the path; so they are not guided. This is how shaytan schemes. he adorned Ghor-onic translations in people's eyes, and made them fall prostrate to Ghor-onic translations, instead of reading Allah's Arabic Ghor-on. And this is how he repelled them from the path of Allah. Allah created all the languages in this world, and He created the awesome Arabic language, which came out of bunch of nomads in an Arabian dessert. Allah Does what ever He wills. Allah be Glorified! Allah already knew that satan is going to whisper to us, and would deceive us in order to translate the Arabic Ghor-on. That is why Allah has chosen each words in the Arabic language with specific meanings. You could have never, and ever, and ever found this out in Ghor-onic translations, no matter how many years you would have read them. This proves to you that you must learn the meanings of Arabic words in order to understand the Arabic Ghor-on, Hikmat. By reading translations one might get just some information, but not the Hikmah hidden in the Arabic Ghor-on. 1- He is stoning, and rejecting the Arabic Ghor-on, as Allah stoned the shaytan. 2- He is Polluting the pure and perfect Arabic Ghor-on, by his own guess works and conjectures. 3- He is throwing stones in front of those innocent people who really want to learn Allah's creation, the Arabic Ghor-on, in order to block their minds from understanding the Arabic Ghor-on. Please people stop translating the Arabic Ghor-on, and stop idolizing the traslators, and stop idolizing translations, and stop reading the Ghor-onic translations. Ghor-onic translations are already stoned, and condemned, and rejected by the Arabic language. How many proves do you need from Allah in order to submit to Allah? In this ayat Allah says, For people who know! . . for people Who know what? The answer is, "Arabic language". Allah be Glorified! Just before you start reading the Ghor-onic translations you say, I seek refuge in Allah from stoned shaytan. Well, save your breath!. . . It is already too late, because that translation has already been stoned, and rejectd by translators. . . And shaytan already made us to stone Allah's Ghor-on! . . . It is useless to repeat that phrase. Ayat (16:98) is only for the Arabic Ghor-on. When you repeat this phrase, the keepers of the Arabic Ghor-on, take satan away from you, therefore he can not interfere with your thoughts. Translators, you are throwing stones in front of innocent people who really want to learn the Ghor-on, yet you think you are helping people! . . Translators, you are blocking people's mind, therefore they are not able to see the actual meanings and true words of Allah in the Ghor-on. Therefore, their minds are frozen on your translation. That is why these people are all so silent, and they do not have any questions, becasue they have been reading the book that you have already stoned. Please GOD forgive me for stoning your Arabic Ghor-on out of ignorance. Please Allah forgive me for throwing stones in front of Your innocent people, and blocking their minds from understanding the true meanings of Your Arabic Ghor-on. And Allah would not leave the believers on their own. And Allah is The Merciful, and The Forgiver. Let us all purify the religion of "Submission" for Allah The Almighty, before it is too late. 39- Before the discovery of the mathematical signs in the Arabic Ghor-on, the most important fact of the Arabic Ghor-on for 1400 years was its Literary Sophisticated Composition and its Literary Excellence besides it is being the book of law. After revelation of the Arabic Ghor-on many of the Middle Eastern writers and poets began to improve their poor work of writings and some of them encouraged to challenge the literary excellence of the Arabic Ghor-on. Actually Literary Excellence of the Arabic Ghor-on was the cause of improvement in civilization and culture of today's Arabian countries and Middle Eastern countries specially Iranians. For example the father of Iranian poetry; "Roudaky" came 285 years after the revelation of the Arabic Ghor-on and most of his poems were all in Arabic language because of Arabs invasions. Most poets and writers used to memorize the Arabic Ghor-on, not because they wanted to follow the Arabic Ghor-on and finding out what Allah is saying in the Ghor-on, but to learn the formula and techniuqes of writing poets and poetry and literature. One example was the very famous Iranian poet, Hafez, (meaning, the one who memorized), who had the Arabic Ghor-on memorized. However when you read his poems you would find out that it does not have to do anything with what Allah says in the Arabic Ghor-on. However Erawnians deny this historical fact that the culture and civilization of Iran it all depended to the revelation of the Arabic Ghor-on. However invasion of E-run by Arabs was a blessing from Allah in order to save bunch of idol worshipping people. But the most important fact is that Translators of the Arabic Ghor-on completely blinded and hided the whole word to Sophisticated Literary Excellence of the Arabic Ghor-on created by Allah. This is a blasphemies act against Allah. May Allah forgives me for trnaslating His Arabic Ghor-on to Farsi language at the time when I was completely unaware. 40-I was advised by a person that I should have been silenced and kept it to myself and should not have to tell any body regarding not translating the Arabic Ghor-on! But, Allah made me realized the story of Moosaw and his brother Haroon. Do you remember that after Allah delivered the children of Israel from the sea, and then Moosaw went to talk to Allah in order to receive the Torah, and he left his brother with his people and told him, "Do not follow the transgressors?" Well, there lies our answer to that person's suggestion. After Moosaw leaves his people, Samary was inspired that if he would grab from the soil from where Moosaw was talking to Allah and mixes it with jewelries and gold, he could have come up with a statue of a cow that would make some kind of noise . . . ! Therefore, Samary convinced Moosaw's people that this cow is the Allah of Moosaw. Then although Haroon was telling them do not be deceived by this guy and his statue, but, he did not enforce them strongly enough because he feared that their people would become divided! . . .
Now Haroon was one of Allah's Prophet Messengers. He made a mistake, and then a believing man namely "Moosaw" recognized that this guy made a mistake. Then this believing man got so angry to the point that he grabbed the beard of Allah's Prophet, namely Haroon, and. . . .
Shall We then take away this message from you, and turn the page because, You are a people who has transgressed the limit? Once again history is repeating itself, and people forgot what happened just 22 years ago although they have been witnessed all these years and some of them even call the other group transgressors! Yet they are following the same exact steps as they did. DO NOT DEPEND ON MY TRANSLATION, IT IS NOT FROM ALLAH, AS YOU WERE ALL WITNESSED I HAVE CHANGED MY TRANSLATIONS 3 TIMES SOFAR. INSTEAD YOU SHOULD STUDY THE ARABIC GHOR-ON, AS I WAS DOING MYSELF ALL MY LIFE, AND DO NOT TAKE MY TAPES AS A SOURCE OF TRUE INFORMATION FROM ALLAH, BECAUSE AFTER I AM GONE YOU WOULD TAKE MY TRANSLATIONS AND THOSE TAPES AS THE TRUE WORDS OF ALLAH, THEREFORE YOU WOULD BE FALLING IN TO AN IDOL WORSHIP AND YOU WOULD BE DESERTING ALLAH'S ARABIC GHOR-ON! And then as we are all witnessing history is repeating itself and again we fell in to the same trap! Amazing thing is that the old timers among us they know exactly that was the case and what has happened before, yet they follow the same wrong way. So why do we have to encourage people to go in a the wrong path? 41- Here is another awesome sign from the Almighty Allah. A scripture whose ayats elucidated, an Arabic Ghor-on for people who know. A bearer of good news and a covenant maker. Then most of them turned away, so they do no hear (41:3-4). Pay attention please, Allah says, the ARABIC GHOR-ON is the bearer of good news and the ARABIC GHOR-ON is the one which makes a covenant with people. NOT any translations of the Ghor-on! But, unfortunately most of them turned away, because they DO NOT want to hear. Please make sure you study these ayats, do not trust me. How many signs do you need from Allah? Let us all purify the religion of "Submission" for Allah. Here are 2 more attributes of the Arabic Ghor-on that we did not know before. One is Bearer of Good News "Bashira"and the other one is that the Arabic Ghor-on makes Covenant "Nazira" with people with all those rules and regulations, or to Scare, Threatener, Frightener, To Terrify, "Nazira" people from the consequences of their actions. Now by this new information from Allah the Almighty, the Arabic Ghor-on is giving us the good news that it came down in an Arabic language, so we can use our intelligent, and is making a covenant with us that it is written in an Arabic language therefore, do not waste your time on translations. Remember the Arabic Ghor-on is the only bearer of good news and covenant maker which DOES NOT make any mistake. Because, Allah made it with His own knowledge. In this ayat Allah is saying that no one knows the interpretation and meaning of the those ayats which they are absolutely clear ayats, Except Allah! Because, Allah made the Arabic Ghor-on, therefore He knows what He created. That will make Allah to be the only teacher of the Arabic Ghor-on. So what is our business to translate what Allah created with His own knowledge, and He is telling us in this ayat that we would never find out their meanings? Do we want to take heed? So stop wasting your time on translations, and let Allah teaches you the Arabic Ghor-on and we have average 40 years to learn the Arabic Ghor-on. May Allah forgive me that out of total ignorance I translated the Arabic Ghor-on to a Farsi Ghor-on! So stop wasting your time on translations, and let Allah teaches you the Arabic Ghor-on and we have average 40 years to learn the Arabic Ghor-on. Certainly Allah bestowed a favor upon believers when HE would raised amongst them a messenger from themselves in order to recite HIS ayats, and (HE would) purify them, and (HE would) teach them literacy and (HE would teach) them Hikmat and although indeed they were clearly stray before this (3:164). As we know Allah is the main source of all knowledge. Allah is the teacher of the Arabic Ghor-on. Allah is the One Who cleanse us (80:7) Allah is the One Who teach us Literacy. Allah is the One Who gives us Hikmat. Therefore, if you think anyone else is able to do these things, besides Allah, then that would have been contradicted with the Arabic Ghor-on and by all means that would have been idol worship. Thank Allah for HIS true knowledge. Allah be Glorified. And when in (9:61) Allah says that Naby, Prophet is a blessing among you, it is because Muhammad saw Allah in the highest horizon so he can tell you what he saw, and because he was given the blessed Arabic Ghor-on. Not because Prophet Muhammad was a good looking man or he was a nice person! Yet, they idolize him regardless. Allah be Glorified for His unending Hikamts. This is how translators misled people! Translators, stop teaching your Ghor-on to other people. 43- In some ayats in the Arabic Ghor-on we read, "A revelation from the Gracious, the Merciful." But, when you read a translation from the Ghor-on, you are actually reading a revelation from the translator. If some one gave you a book and said this is the Ghor-on, make sure it was written in an Arabic language. Because, Allah says HIS Ghor-on is in Arabic language. The ones who study a translation of the Ghor-on they only get a minute knowledge given to that translator, and then when their translator dies their knowledge die as well and they would left alone frozen in time! . . .
Actually in a way translators make themselves and their Ghor-on translation as an intercessor. They say, "my Ghor-on translation is the same as Allah's Arabic Ghor-on." But, translators they fear their wives, their children, their friends and the society which they are living in, and they can not ever be honest to others when it comes to traslation of the Ghor-on. Translations of the Arabic Ghor-on are not like the Arabic Ghor-on that every time you read from it you would get new information. Please people do not waste your time on translations, they are not from Allah, and let Allah teaches you the Arabic Ghor-on, do not take translators as a teacher of the Arabic Ghor-on besides Allah, The only teacher of the Arabic Ghor-on is Allah The Almighty. "But if they do not respond to you, then know, that it (the Arabic Ghor-on) has been sent down with Allah's knowledge, and that there is no Elah but He. Will you then submit?" As you see it says that the Arabic Ghor-on was made with the knowledge of our Creator, Allah. But, those translations of the Ghor-on made with the knowledge of the translators. Now, you tell me, which one of them are you going to study? Let me tell you an important fact. You can study the Arabic Ghor-on, but you can not study a translation of the Ghor-on, yet you just read a translation, because some one else already studied the Arabic Ghor-on and that is how he came up with a translation of the Ghor-on. Thanks to the Almighty Allah's Hikmat. That is why the ones who are reading a translation of the Arabic Ghor-on, they are actually reading a Ghor-on besides Allah's Arabic Ghor-on, and that would consider as a Shirk, or idol worship. That means they believe that there is another Elah besides Allah, as the aweyeh says. Then are you going to submit, or you just want to study those translations? "The Most Important Historical News Of Our Time"
The reason why there are so many manmade religions and hundreds of sects and divisions between them, Judaism, Christianity, and the this last one Islam and . . . to name a few, is that each Party started to follow translators or Interpreters of the Scripture according to their own personal understanding of the Scriptures. Unfortunately through the years satan came up with translations of the Scriptures, in order to mislead people. That is why in each corner of this world we are witnessing a group of people idolizing the translators of the Scriptures, or preachers, or leaders of the Churches, or Mosques, or Synagogues. 99 present of these people have not learned the languages in which their Scriptures was send down with (Hebrew, Aramaic, and Arabic language; Torah, Enjeal, and the Arabic Ghor-on). shaytan hypnotized people, that is why they are blindly following the translators. This website is expressing, in the strongest terms, that any one who reads translations of Allah's Scriptures, that means he or she is following another god (translator) besides Allah, The Almighty, and he or she is following another scripture besides Allah's Scriptures. The Arabic Ghor-on by definition calls this person "Moshrik", or "Idol worshiper". In the Arabic Ghor-on, Allah specifically emphasized in 10 verses that Ghor-on was sent down in an Arabic language, and Allah wants us to learn the Arabic language in order to undertand the Ghor-on, and He promised us that He will teach us literacy, and He will teach us the knowledge which came with the Arabic Ghor-on, Hikmah. Allah is The Only Teacher of the Scriptures. All the Rabies before becoming a Rabbi, they must go to Israel in order to learn Hebrew language, so they can understand Torah. The reason is that they respect the language of the Torah. Priests must learn Latin language as well. If you want to take a course in Archeology in Sorbonne University in France, you must learn German language first. In Chemistry you must know what H2O means. In computer science you must know the Machine language, in Medicine you must know the Medical terms in Latin. In Electronics a technical writer must know technical writing language. In music you must know the language of Music. Ask yourself, why is it that when in news media they talk about Ghor-on, immediately they show a picture of an Arabic Ghor-on? Because every one in the world knows that Ghor-on was revealed in an Arabic language, except a few Translators! Allah Created the Arabic Ghor-on for humans, and then Translators came up with Translations of the Ghor-on beside Allah's Arabic Ghor-on! Remember when you start studying the Ghor-on in its original language, the Arabic Ghor-on, which Allah intended for humans, then the "Hikmah" of the Ghor-on is going to be revealed to you. Dear brothers and sisters, Allah is the all Gracious and the Merciful, Allah is forgiver, acceptor of repentance, please listen to the call of Allah in the Arabic Ghor-on. Within these last moments, the Most Gracious and the Most Merciful is giving us another respite. (47:7) O you who believe, If you help Allah, Allah would help you. Please pay attension: The order of revelations to prophet Muhammad was different than the Ghor-on that we see today. Muhammad was receiving the revelations from the Holy Spirit according to the event of his time. So when you read the Arabic Ghor-on in the order which it was revealed to prophet Muhammad, you would findout what they have been going through, and at the same time you would get Ghor-on's Hikmat as well. Holy Spirit was instructing him as to where he should place the suras in the Ghor-on, after revelations were completed. As Allah says in the Ghor-on, We have arranged it, what an arrangement. So, both arrangments are perfect, becasue they are from Allah. Only one of many reasons for this arrangement that we have today was, because we were supposed to witness the awesome mathematical signs in the Arabic Ghor-on in our era. If they would not have destroyed the Arabic Ghor-on written by Muhammad's hand, today we would have had both arrangements, and one could have studied both of them. It is an awesome blessing from the Almighty Allah that for the first time in history, after 1400 years, now on this website, both forms are avaiable. Please download them.